The research of our lab focuses on the development of Semantic Systems, both from a theoretical and practical point of view. 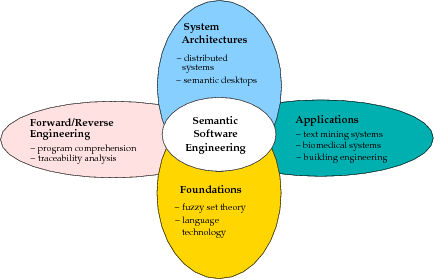 Semantic system engineering encompasses theoretical aspects as well as the systematic design, implementation, and deployment of knowledge-oriented software systems. Software Development and Reengineering, combining software engineering methods with ontology- and text mining-based approaches to enhance program comprehension, software maintenance, architectural recovery, software evolution, traceability, security analysis, and process models. This is joint work with Jürgen Rilling from Concordia University. Semantic systems for the life sciences and biomedical knowledge discovery, integrating bio-informatics and language technologies with the Semantic Web. One example is the Open Mutation Miner project, which focuses on the protein engineering domain. System architectures and software engineering solutions that bring active knowledge management support to end users, in particular the engineering of semantic desktops and semantic wikis, as well as the Semantic Assistants project. This research aims at bridging work in software engineering, information system engineering, agent technology, natural language processing, and the Semantic Web. Software Engineering for NLP and Text Mining, where we investigate the development of systems that include language technology at some level of integration. Here, we are especially interested in the application of software engineering practices to the domain of NLP and computational linguistics, such as service-oriented architectures for NLP and the professional engineering of language solutions, including design processes, cost estimation, maintenance planning, and system deployment. Computational Linguistics and NLP, where we develop the necessary foundations for system deployment, in particular for automatic summarization, chunking, coreference resolution, and textual entailment. Here, one of our interests is the formal representation of uncertainty and inconsistency in NLP using soft computing methods, such as fuzzy set theory. Some of the underlying language technologies are developed in cooperation with Sabine Bergler from the Computational Lingustics Lab (CLaC) at Concordia University. Information system engineering with a particular emphasis on semantics, especially unstructured data management, text mining, knowledge discovery, and uncertainty management. Within the Durm encyclopedia project we previously developed foundations and systems for dealing with cultural heritage data, exemplified on a 19th-century encyclopedia of architecture, supporting building historians and architects. We also investigate IT system support for lexicographers, in particular for the Dictionnaire étymologique de l'ancien français. See the list of past and present projects for application examples of these technologies.